The film production industry is rapidly changing. The technology is evolving at a rate that seems almost impossible to keep up with. People are able to make movies all from their smart phones, and have them be of great video quality. But when it comes to having any camera—literally, the lowest quality camera that you can have—how does one make great content with their resources that are accessible to them? Simple. Take a stylistic approach before beginning production on your short film. Use the footage you have to your advantage. Do not take low quality footage as a disability, more so as an enabler to create content with a stylistic purpose. While beginning my Production studies at the University of the Incarnate Word, I took a Video Production course. I had to create a short film for as a final project. Panicking, as I did not have a direction for the film the weekend prior to the assignment being due. I waited until the very last minute to film. It was too late to try and borrow a friend’s Canon Rebel T3. I asked my aunt to borrow her DSLR she had purchased from a pawn shop 5 years prior. Thinking that DLSRs, no matter how old, were at least more advance than my iPhone 6. I begin to film a horror short that I storyboarded at work. With my storyboard handy, my aunt’s Fujifilm camera, a ladder, phonebooks, a bat, and fake blood, I began to film. While filming, I literally had no clue that the quality was as low as it was, as from the screen of the DSLR the footage looked somewhat decent. 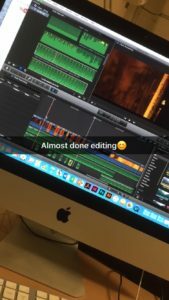 I finished filming the short, which was actually easier than one might expect considering I directed and stared in it, while also being the only cameraman, and went to school the following Monday (the day the assignment was due) and began editing my life away. Upon importing the footage, the quality was so low. I wanted to cry out of panic. With it being too late to reshoot, I took what I had in stride, and begin to edit according to the storyboard that I had created for myself. Then it clicked. I have a love for horror films from the ‘70s, which had unintentional grainy effects on them due to most of them being low-budget (i.e. John Carpenter’s Halloween), similar to my film which had literally no budget whatsoever, and decided I was going to merge the ‘70s and the early ‘00s and create a recorded snuff-like, slasher film. After editing all my shots together, I went back and added a REC filter to the scenes that seemed to have the camera held by the killer himself. I added heavy breathing, and voilà, the film that looked like it was intentionally shot that way. Just in time for my 6:00 P.M. night class. I got an A on the assignment. I still get references to that short film from classmates to this day. Overall, I learned that no matter what you are faced with while filming, you can make the best out of the worst situation by adding some very cheap effects, and by throwing your love for the craft in the mix. Good luck, don’t procrastinate, and watch my very bad short-horror film Rec.